Yuma is a veritable small city of over 93,000 residents nudged up along the California-Arizona border. The city is rapidly growing, and the area is stereotypical portrayed as a desert. This is not a false depiction, either, with the lowest rate of precipitation in the Lower 48. There is only a little over 3.25 inches of rain a year, and the average sunshine hours clock in at over 4,000 hours annually. That puts the rate of sunshine at 90% of what is possible. For every 100 hours of daily in Yuma, 90 of them are full-on sunshine. This very high percentage clearly lends itself to gathering power from our nearest celestial light-and-heat repository, the sun. Click here if you’d like a free quote from a trusted installer. The sun fuses atoms together to make all that energy, and it makes a huge amount. A couple hours of sunlight on the Earth’s surface is sufficient to power the entire world’s energy needs for a whole year. Of course, we don’t want to cover the planet in solar panels, but we don’t need to produce an entire year’s worth of energy in a few hours. We can do it all year long. And while our energy needs are increasing, the sun can provide ample energy without causing significant carbon contributions. You can help lead the charge by installing a home system. Elon Musk, the dreamer behind Tesla Motors, Space X, and various other futuristic companies, has announced his company can produce slick, attractive, modern solar roofs cheaper than a regular roof (of course depending on roofing material). 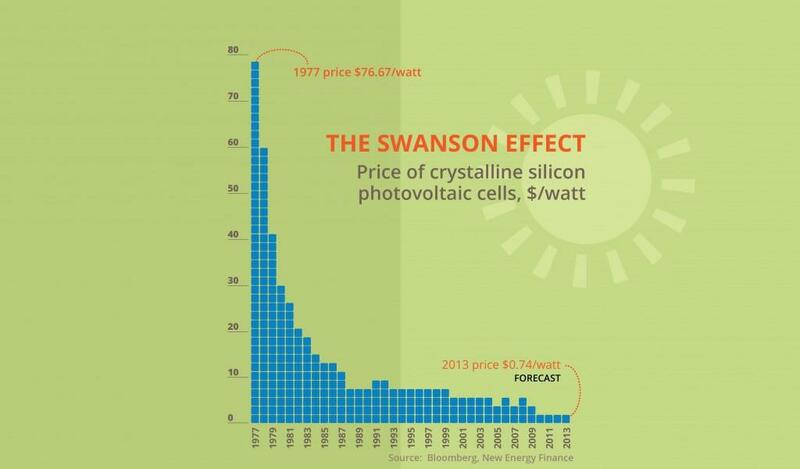 This is the Swanson Effect in all its glory: the more solar panels sell, the cheaper they become. The concept relies on the simple economics that the more revenue something generates, the more competitors engage. The more competitors engage, the more money is put into research, which in turn lowers the price of panels. Just from 2008 to 2012 the price of solar panels has fallen off a cliff, with a 67% reduction in prices in just those four years. An average home system of 5kWh will cost you about $20,000. That is a steep price, but the first form of assistance comes from the US federal government, which affords you a 30% tax credit for any solar installation on your residence. This means you can think of it more like $14,000. That money does not simply disappear, either. Your home will be worth $20,000 more, but the Renewable Energy Systems Property Tax Exemption from the state of Arizona allows you to exclude that newly added equity from your tax bill. By year 25, with tax credits and energy savings, you will have upwards of $30,000 in profits. Yuma is very hot in the summer and indeed rather warm in the winter, requiring air conditioning. If you’re running a small business out of the city, you will need energy for at least some of the processes. This can all be powered through the correctly proportioned solar system, and you will eventually reap the benefits of the not having to rely on fossil fuel power generated far away by some utility company. ROI varies slightly based on your financing method, and those methods are straight cash, using credit, and leasing. 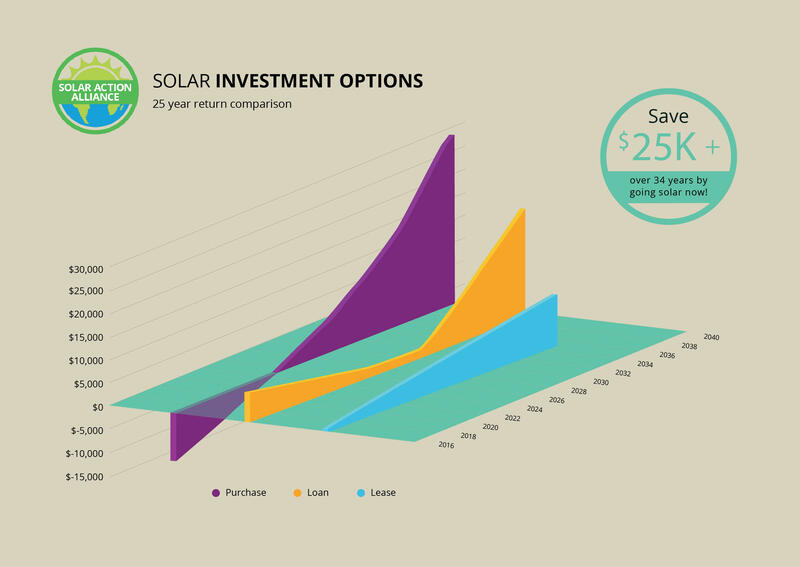 Don’t let the initial $20,000 price tag hinder your interest in a solar system for your house. Cash is the best and most hassle-free way to finance the project. The only drawback is the large initial capital expenditure you have to apply. There are no interest payments and you own the system as soon as you hand over the cash. 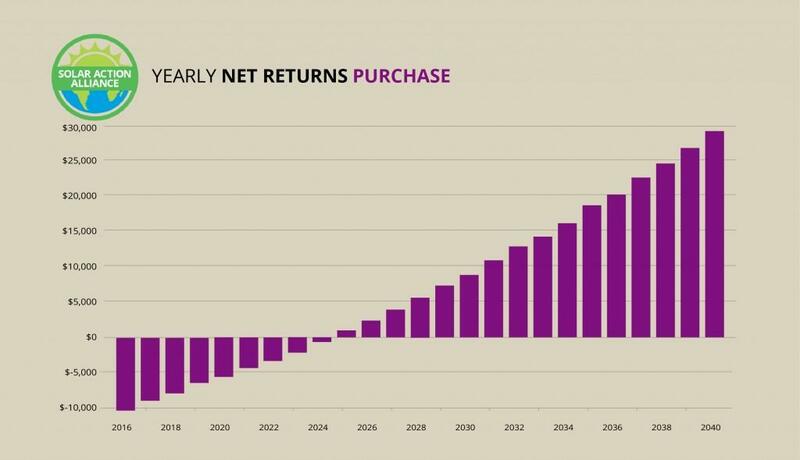 This means no savings are diluted by interest payments. If you save $1000/year on energy costs, you could start to see your panels pay for themselves in just a little over 10 years. A household that uses significantly more energy than average, perhaps through heating for business purposes and cooling due to air conditioning will see much faster times to payback. The financial benefit via the cash avenue is the greatest, because you will pay zero in interest and the entire savings will be yours to keep. Credit would entail getting a loan. 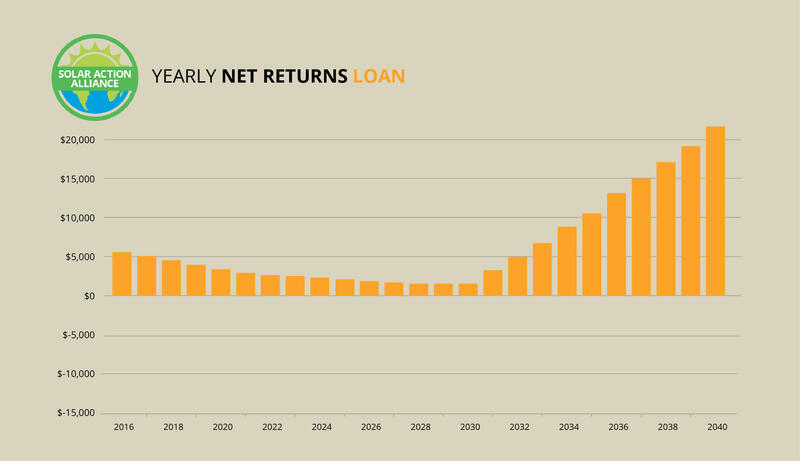 There are several banks in Arizona that specialize in loans for solar, though you can also get secured loans with your home as collateral. Check out EnergySage to find out more and if you already work with any of the banks. The interest is tax deductible, which is another incentive by the government (as the government is the one reducing its revenues for your benefit). As the loan is paid off, your equity in the system rises and eventually you own the system outright. 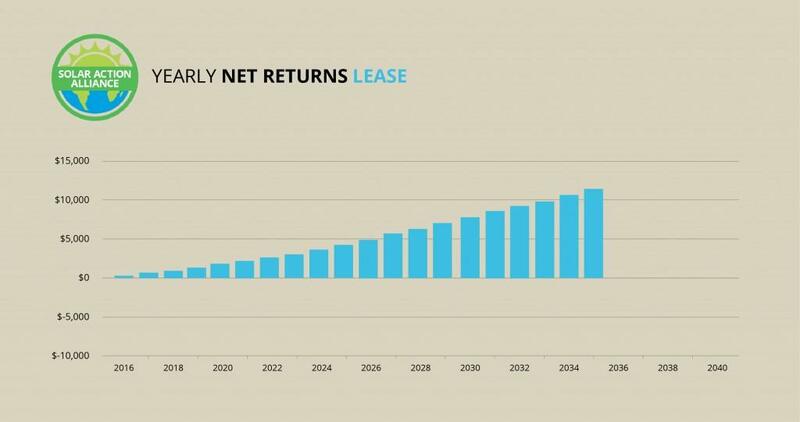 Leasing the equipment is just like leasing an apartment or a car. You do not own the equipment but pay for its usage. If you are happy with the setup, at the end of the lease you may renegotiate or you can return the equipment. Maintenance on the system is often taken care of by the lessor, who will package maintenance into the lease. Don’t use this as a deal-breaker, however, because systems do not require much maintenance. One major drawback, though, is that you cannot take advantage of any of the tax credits – you don’t own the equipment, so your home equity doesn’t rise and you cannot get any credits. 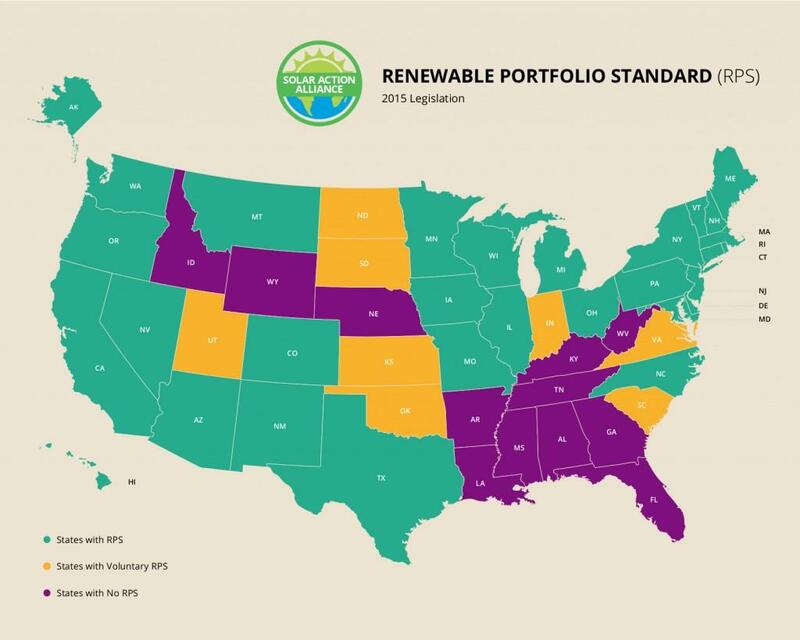 The Renewable Portfolio Standard (RPS) is the number behind how serious a state is in implementing solar, wind, and other renewables. The number indicates how much energy must come from renewables by a specific date. The higher the number, the better, as this generally translates to more incentives from government and utility companies to help you start your project. Arizona, while the sunniest place in the US, does not have a great RPS. The government mandated percentage of energy that must come from solar by 2025 is only 15%, which is lower than the other states in the Sunbelt Region. Furthermore, as the utility companies come close to achieving the low requirement, they are not offering as many rebate incentives to install new systems. With all that in mind, 30% of the RPS requirement must come from “clients”, or the homes and businesses who buy power. That offers a good advantage to you, since the power companies do still need people to install solar. Arizona is in the perfect position to generate more solar energy. With up to 7kWh per square meter per day of solar energy hitting the Earth’s surface, even if you have a small roof or property to place a solar installation, you will generate a lot of electricity. And while Arizona may not offer the best incentives to go solar, you will not be left completely without government tax credits to install. Another drawback is the low energy costs in Arizona. Certainly electricity costs more in places like California, so installing excess solar panels may not save you enough to make the decision; coupled with the lower government incentives, you may decide against solar. However, don’t forget, living in Yuma, you are in one of the sunniest places in the country, and no governmental actions can change the way the climate works. It would be especially lucrative to you if you have a high energy bill, possibly because you run a small business out of your home that requires large energy consumption. The many benefits of having a residential solar system include not paying electric bills, having a freedom that is not afforded many people (no need to rely on a company for something as essential as energy), and, of course, saving the planet. We do not expect another Enron, but energy prices do fluctuate and can be somewhat unpredictable. Yuma will have lots of solar energy for at least the next few hundred thousand years. The sun itself won’t extinguish for billions of years, and before that we will no longer be humans as we are today. For those days that are less sunny, which almost do not occur, or at night, you may consider installing an energy storage system. Two great ways to store energy are through water and batteries. Currently, the latter is not well-developed enough for use at home, but the same guy who will provide you cheap solar roofs hopes to change that soon. Heating and cooling water to use later is also a great way to store energy, because it is easy to insulate water storage containers and the chemical properties of water ensure it will take little volume for large stores of energy. 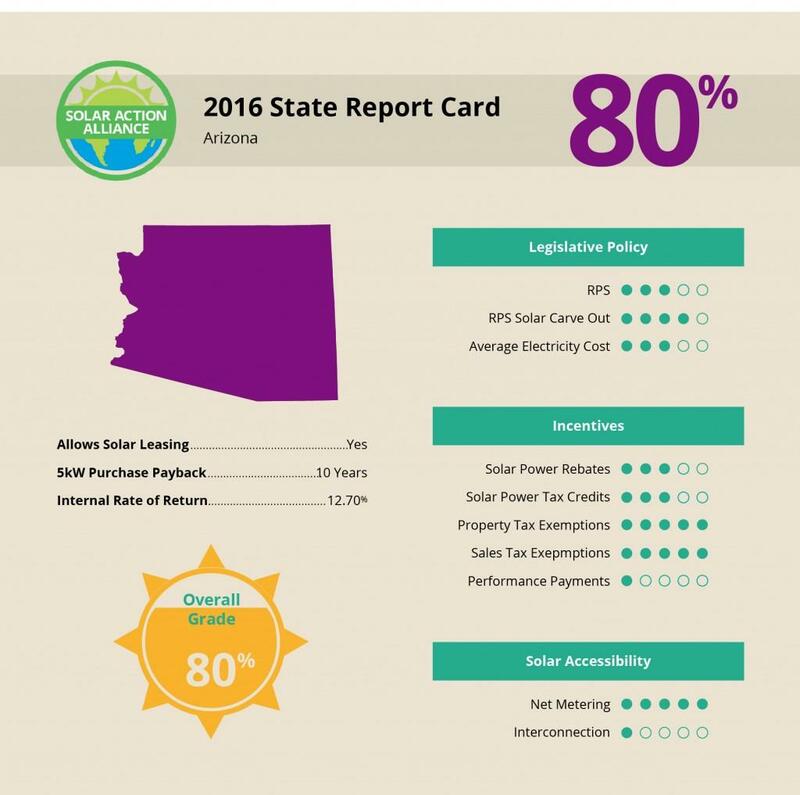 The state offers you decent incentives to go solar, and the fact that the area is such a solar hotspot gives Yuma a high rating. It would be most beneficial, again, if already have a high energy bill, but you can always increase your energy consumption by starting a small business – this would provide the double benefit of making extra money off your business and utilizing your solar system to its maximum potential. Such a business idea would be manufacturer or hosting services.. Based on legislation alone, there are definitely better places to invest in solar. However, net metering and the tax exemption in the state are sufficient and on par with a lot of other states in the region. Of course, you may want to go solar for the environmental impact. If you feel your state does not do enough to protect the environment and slow climate change, you should take those convictions into consideration. If you want to decrease your carbon footprint, solar in Yuma is a great way to go.